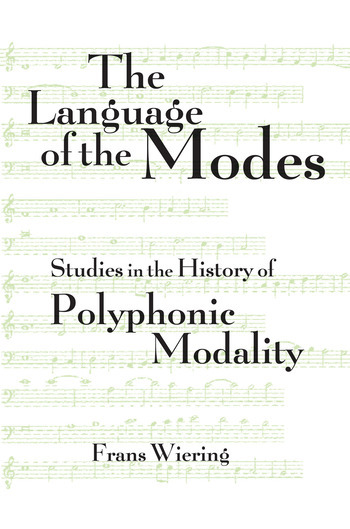 The Language of the Modes provides a study of modes in early music through eight essays, each dealing with a different aspects of modality. The volume codifies all known theoretical references to mode, all modally ordered musical sources, and all modally cyclic compositions. For many music students and listeners, the "language of the modes" is a deep mystery, accustomed as we are to centuries of modern harmony. Wiering demystifies the modal world, showing how composers and performers were able to use this structure to create compelling and beautiful works. This book will be an invaluable source to scholars of early music and music theory. in early music through eight essays, each dealing with a different aspects of modality. It codifies all known theoretical references to mode, all modally ordered musical sources, and all modally cyclic compositions. This book will be an invaluable source to scholars of early music. Frans Wiering earned a Ph.D. in Musicology from the University of Amsterdam in 1995. Wiering is currently on the Faculty of Mathematics and Computer Science at the University of Utrecht and is active in projects to digitize music sources, making them available on-line. He lives in Utrecht, the Netherlands.